You suffer from malnutrition when the food you consume fails to provide you the nutrients required by your body. It is also known as under nutrition. Malnutrition also results due to impaired metabolism or mal-absorption. Adolescents, infants, elders, pregnant women and breast feeding mothers are more prone to malnutrition. This is because they need extra nutrients. There is a tendency for the metabolic processes to slow down. Signs and symptoms can be observed. The progressive loss of lean body mass in a person is known as sacropenia. Usually this begins after 40 years of age. Men lose up to 22 pounds of lean muscle mass and women lose up to 11 pounds of lean muscle mass. Malnutrition is one of the reasons for this abnormal loss of lean body mass. This can cause a lot of health problems like low immunity, infections and heat related problems. Cachexia is a condition in which you suffer from severe loss of weight. The masc. mass and the bones undergo shrinkage and the skin starts to become dry. Your skin also loses its elasticity. You will suffer from various health problems like high pressure, ulcers and hip fractures due to cachexia. 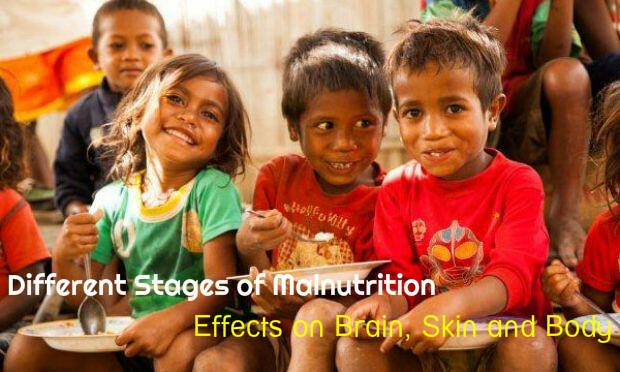 When a child suffers from malnutrition, it can lead to poor development of the brain. The brain development is poor when compared to other children of the same age group. You will suffer from apathy, depression, self-neglect, deterioration and introversion. So, it is very important that children are provided all the essential nutrients required by their body through their diet. Due to malnutrition, fertility can be reduced in an individual. When you become pregnant and you are suffering from malnutrition, it can give rise to heart disease, stunted growth, diabetes and stroke in the baby at a later stage of life. So, when you are pregnant, you must make sure that you consume a well balanced diet that is rich in all the essential nutrients needed for the body as well as the growing embryo. Kwashiorkor is also a protein-energy deficiency that is very common in children who are suffering from malnutrition. Although marasmus and kwashiorkor are caused due to protein-energy deficiency, both are different. Symptoms of kwashiorkor include distended belly, rashes on the skin, bloating, apathy, water retention, enlarged liver and so on. Your hair becomes discolored and brittle with a copper sheen when you suffer from this disease. Marasmus is also a result of malnutrition, in which an individual suffers from protein-energy deficiency. When your body lacks proteins and calories, then also this can be caused. When you suffer from Marasmus, your skin becomes thin and paper-like. The skin also becomes dark. Other symptoms of marasmus are severe weight loss, apathy and pinched facial expression. Malnutrition can affect various organs of the body and lead to endema, anemia and jaundice as well a liver, kidney and heart failure. As a result, you will suffer from pneumonia, urinary tract infections and gastroenteritis. Due to malnutrition, if your body fails to get enough proteins, carbohydrates and vitamins, you may suffer from poor healing of wounds. So, there is an increased risk of getting infections when there is any wound on your body. If you undergo any surgery, the healing process will be slower when you suffer from malnutrition. When children are subjected to malnutrition for long terms, stunting is the result. This is a condition in which children fail to grow in the normal way. Their weight as well as their height is less than normal. This can be corrected by letting the child have a well balanced diet. However, if the child is chronically malnourished, stunted growth becomes permanent and this hinders his normal height, body weight as well as the development of his brain. When you suffer from malnutrition, a lot of health problems are caused. It can destroy the carbohydrates, proteins, vitamins, fats and minerals present in your body. When your body becomes deficient in minerals and vitamins, a number of health issues are observed. For example, if you lack iron, you may suffer from anemia and low red blood cell count as iron is essential for the production of red blood cells in the body. If your body is deficient in Vitamin C, you may suffer from scurvy. This is a disease that causes discoloration of the skin, bleeding gums and so on. So, it is important that you include adequate amounts of minerals and vitamins in your daily diet. This way you can prevent malnutrition and any deficiencies that you body may suffer from. The immunity of your body is reduced. Malnutrition is a serious problem all over the world. War, natural disasters and poverty can lead to people suffering from malnutrition and it’s after effects.